So, Pinterest. We all love it right? I hated the idea of it at first and only signed up so that I could send an invitation to my sister. But then I found it useful for 'pinning' things I saw on other blogs that I wanted to remember or have a go at myself. This year I've been trying to work through my 'to do' list as I've found it's very easy for us seamstresses and crafters to get excited by all of the ideas out there but never get around to actually making anything. 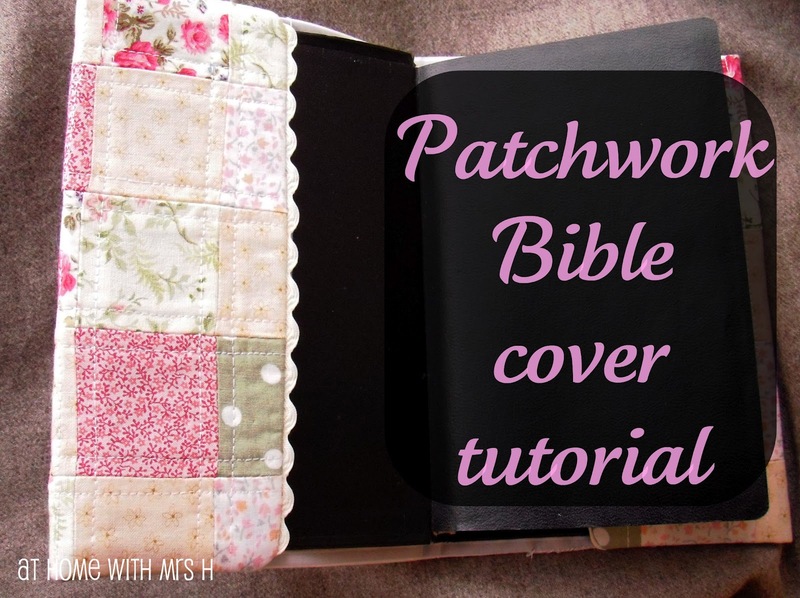 I pinned a great bible cover. The only problem was there wasn't a tutorial, just a few beautiful pictures. So I made one and created a tutorial so that I could share it. Ok, step one, get your beaten up Bible (or other book you'd like to cover) and a few chocolates. They don't need to be Ikea chocolates, they're just what I had handy. Next you need to measure around your book to see how big you want the flaps that will hold your cover in place. Take your tape measure and see how far you want it to overlap and then wrap it around the book fully to the other cover. I added 4cm onto each end for my seam allowance and a bit of wiggle room. Measure from the top of your book to the bottom and add 2cm on to the top and bottom. Ok, now it's time to start gathering your fabrics. I chose pinks, whites and green. No wait, go back and eat your chocolates before your husband realises you brought some upstairs! Ok, now you can admire your pretty fabrics. I took all the fabrics out of my scraps basket but don't worry, it's still over flowing!! This is where I make life complicated. I decided I wanted the finished squares to be 4cm so made a template 6cm x 6cm which allowing for my seam allowance of 1cm would end up being 4cm. Still with me? 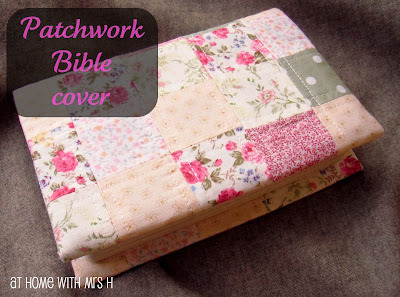 Then I divided my width of my Bible by 4cm to get 11 squares and then my height of my Bible to get 5 squares. Ok, so I needed 55 squares. Yes? No...me either. Maths isn't my strong point. Anyway, I cut 55 squares and laid them out until I was happy with my 'random' pattern. Anyone who knows me will know I have issues with 'random'. I piled each row up in order and sewed the 11 squares together. I ended up with 5 rows of squares. I ironed the seams open and then sewed the 5 rows together. I referred back to my lay out photo more than once during this process! Then I laid the patchwork piece out on some grey felt (cheaper than batting) and pressed it. The felt kinda fuses to the cotton meaning there's no need for basting. Using the inside gap of my walking foot I quilted up and down the rows and columns on my machine. Try not to be too accurate with your stitching, you don't want your friends to think you're better than them and find other friends. It's around about now that you can start wishing you'd rationed your chocolates instead of eating them all at the start. 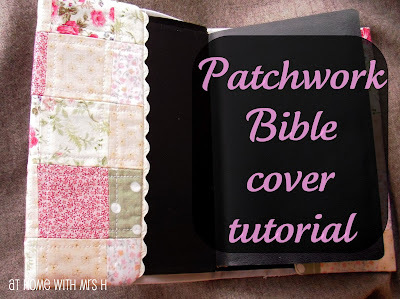 Ok, so now lay your backing fabric out on top of your patchwork and cut your patchwork down to size. I told you I'm not good at maths, I thought they'd both be the same size but evidently not. Oops again! Maybe I should have brazened that out and pretending I'd meant it. Oh well. Anyway, if you're going to use some ric rac trim on the inside edges now is the time to sew it on. Don't forget your seam allowance like me, pin it where you're going to be sewing your seam. I forgot so did it right along the very edge. Don't forget to trim your edges to help your corners stay sharp. Turn it right side out and press well. I turned over the flaps and pressed those in place too. Using a whipstitch I stitched the flaps to the main cover. You can see here about halfway along I stitched through the flap layer and both of the lining layers. This is to close the turning gap. On the other 3 ends you will only need to stitch through the two lining layers. How many books do you want to cover now then lovelies?